It was Sunday, a very boring bloody Sunday afternoon and I stayed at home. I had the blues, I was down, depressed, you know, like any odd weekend before horrible Monday comes. My archives were reaching the red mark, way past the warning sign saying, alert, alert tomorrow you will have nothing to post so I decided I had to fetch some insignificant objects and let go my imagination. As you see my imagination had decided to go for a walk without me so I came up with this "miserable" macro of some plain shell bracelet. Please be lenient with me. Aw, Carlos, I hope that Monday won't be so bad and I'm truly sorry that you had the blues over the weekend. I do, however, think that you have a more appealing shot here than you realize. 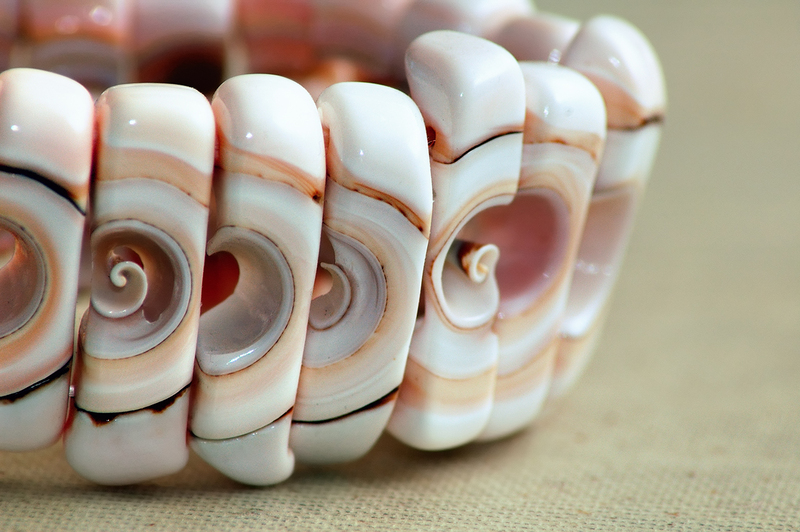 I like looking at the intricate detail of the beads and I love their color. The simplicity of this seemed to be just right for my mood. Thank you. Surely this one has the amazing texture embedded in this ornament. Beautiful! Carlos were are the photos ??? I know what you mean about imagination and the whole daily photo thing. Some days it is easy and sometimes not quite so. Still I do like this macro photo. You should have e-mailed me. I went to the Picasso Museum at La Ribero on Sunday and had a wonderful time. Thanks Lydia for your support. Ming, I was waiting for you. I am sure I wouldn't have much time but still my last words were "drop me a line". Anyway I have a day job and a family and besides on the weekend we stayed at home. If you look at the exif of my pics on Flickr, these are not fresh images. I do like the fact that you had a good weather and enjoyed Barcelona. The bracelet is fabulous. It reminds me of little ears all strung together. What a gift that would be to have a bracelet listening to all of the world around you. Life is stressful,more times than others,thankfully we have family and friends who love us :-) Hope your week is better!